The dolphin fin we have on display at the Grant Museum comes from the short-beaked common dolphin (Delphinus delphis) which is found mainly in the North Atlantic, North Pacific and South Pacific. This dolphin is a carnivorous marine mammal which feeds on small fish such as herring, anchovies, hake and sardines. Their diet however does depend on the region that inhabit; common dolphins near the Atlantic for example feed primarily on lanternfish. There are over forty species of dolphin. Although they differ in size and appearance, common characteristics within the delphinid family are large group sizes and a complex social structure. 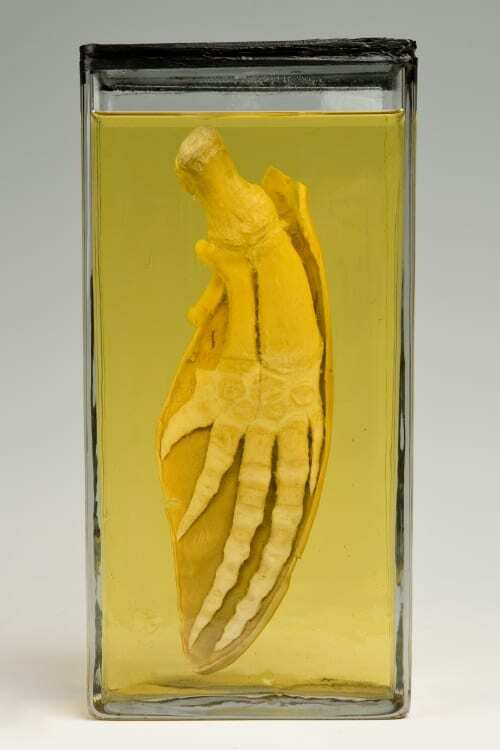 As I mentioned in the introduction, this week’s specimen is great for demonstrating to visitors the physical similarities we share with other tetrapods. 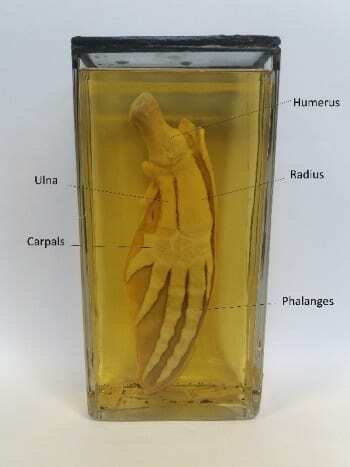 Visitors are often amazed to find out that the bones of the dolphin’s pectoral fin are homologous (having the same evolutionary ancestry) to the bones of the human arm. The main differences are of course the shape and the fact the pectoral fin is held together by connective tissue and cartilage. Human fingers are not connected, so we can move our phalanges (fingers) independently. As the pictures below demonstrate, they are remarkably similar. 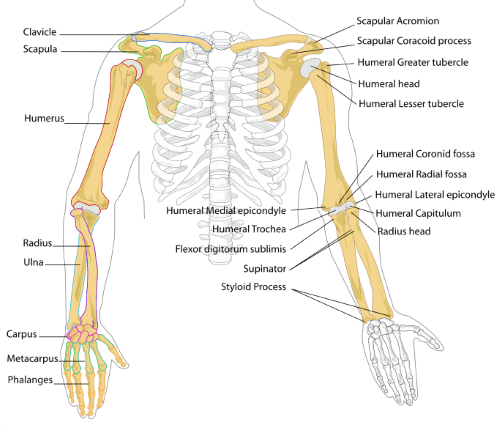 Human arm with bones diagram. Image by LadyofHats Mariana Ruiz Villarreal, via Wikimedia Commons. Dolphins are known to be highly intelligent animals. Their communicative abilities are well documented, particularly their ability to interact with each other by making clicking and whistling sounds. Something not many people may know however is that they can do this simultaneously. Dolphins use different sounds (whether it be clicking, whistling or ‘burst pulsed sounds’) for different purposes, creating a form of communication that is complex and variable. 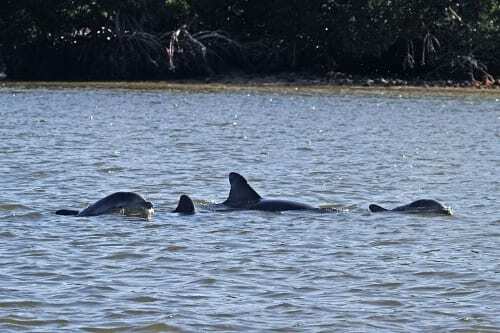 Another example of the remarkable intelligence of dolphins was documented by an aquatic research centre in the United States. The dolphin in question learnt how she could get rewards from her trainer by presenting them with litter and birds which lurked near the tank. What’s most remarkable about this story is that she taught these self-learnt techniques to her calf. This episode demonstrates a tremendous level of intelligence and dolphins have rightly earnt their reputation as one of the smartest animals on the planet. Cetacea are a group of aquatic mammals which include whales, dolphins and porpoises. All cetaceans are carnivorous and some, such as dolphins, employ a number of different techniques when hunting. Central to all their hunting however is echolocation. Dolphins (and some toothed whales) will use clicks and listen for the echoes, which reveals the location of the fish. Once they have revealed the location of the fish they capture their prey using highly coordinated teamwork. ‘Herding’ is performed by a group of dolphins who surround a school of fish as tightly as possible, after which they will take turns eating as the others maintain their formation. The second technique is ‘corralling’, whereby dolphins chase fish to shallow waters where they cannot escape. Dolphins cannot chew. They use their teeth to grip the fish, then swallow it whole.